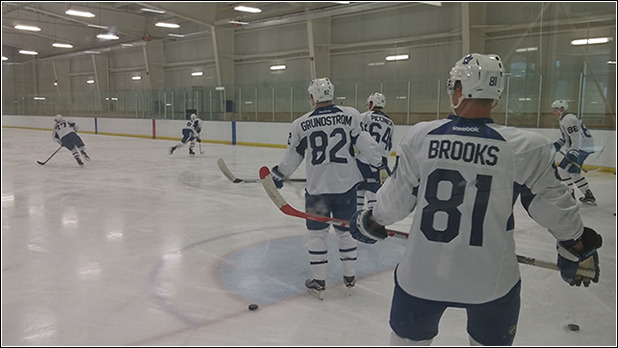 After a week of education, testing and competition, Maple Leafs prospects wrapped up the organization’s 2016 development camp Saturday morning with a spirited scrimmage at MasterCard Centre in Toronto. The score of the contest was of interest to diehard fans who’d crowded around windows at one end of the rink and to thousands more watching a live online feed of the game, but for Leafs management and the players who’d participated in the camp, the most important takeaways had far more to do with the ongoing growth of the group as a whole and the talented young individuals on the ice. Although much of the media’s focus during the development camp was on 2016 No. 1 overall draft pick Auston Matthews and 2015 No. 4 overall selection Mitch Marner, the Leafs could point to dynamic youngsters such as forwards Dmytro Timashov (selected 125th overall in 2015), Adam Brooks (92nd overall in 2016) and Carl Grundstrom (57th overall in 2016) and defencemen Andrew Nielsen (65th overall in 2015), Travis Dermott (34th overall in 2015) and Jesper Lindgren (95th overall in 2015) as components that give Toronto much more depth and promise for the future than they’ve had in recent memory. And for Marner, the fact that there were fewer players at camp – 41 in total this year, down from 57 in 2015 – helped build a sense of cohesion and unity among the group. Matthews shared Marner’s feeling that the camp was beneficial on a number of fronts. As Babcock noted, the week centred around learning, and the 18-year-old Matthews embraced learning more about the history, prestige and responsibilities that come with playing for a storied Original Six franchise. Matthews also pointed to the Leafs’ mental health seminar for prospects as something that was much-appreciated by young men who put all sorts of pressure on themselves to win games and improve every day. Toronto’s prospects now will scatter back across the globe to spend a precious few weeks with friends and family before turning their sole focus back to hockey and preparing for training camps in the fall. But this week presented both players and team brass with a brief window through which to see how far they’ve grown. And everyone is encouraged by what they’ve seen – and excited about what’s ahead.